CHICAGO, Illinois, February 9, 2012 (ENS) – The latest hybrid concept vehicles are among the top attractions for visitors this week in Chicago at the largest and longest-running auto show in North America. The public is welcome at the 2012 Chicago Auto Show from February 10-19 at McCormick Place, the 104th edition of the show. Other top trends visitors can expect to see in Chicago are advancements in technology and safety and increased connectivity with social media through voice-activated commands. During Media Preview day at the show Wednesday, MotorWeek, one of television’s longest-running and most respected automotive programs, announced its 2012 Drivers’ Choice Awards. “We look at the factors mattering most to consumers – price, practicality, performance and fuel efficiency,” said the MotorWeek editors. Not only does the original Prius outsell every other hybrid, but it still beats them all when it comes to fuel economy, the editors said. It’s being joined by a plug-in hybrid Prius, a more versatile Prius v wagon, and the Prius c with the highest city fuel economy rating in its class. The 2012 Rio subcompact, which gets 40 miles per gallon, was recognized for performance, fuel efficiency and overall value to take the Best Subcompact Car title. Last year the MotorWeek Best Luxury Sedan award went to the Infiniti M. This year it wins again by adding a full hybrid model. “Never before has cruising at 60 in electric-only mode been so enjoyable,” the MotorWeek editors said. Looking to the future, automakers are debuting 10 concept cars in Chicago – prototypes made to showcase an idea, test a new styling direction, or highlight advanced technologies. Environmentally sound vehicles have been a theme of these concept designs over the last few years. Many feature hybrid powertrains or are electric vehicles. Others highlight the use of renewable materials or energy-saving technologies. This year, Acura is showcasing its first-ever hybrid offering, the ILX Concept with a 1.5L gasoline-electric hybrid powertrain – the precursor to Acura’s luxury compact sedan scheduled for launch in spring 2012. Cadillac is offering a concept hybrid luxury convertible, the Cadillac Ciel “dream car.” Powering the Ciel is a twin-turbocharged version of the 3.6-liter direct injection V6 engine, paired with a hybrid system using lithium-ion battery technology and a new hybrid transmission with low-speed all-electric drive. Chevrolet is showing two concept cars. First, the Code 130R is a four-seat coupe with a 1.4-liter Ecotec turbocharged four-cylinder engine that delivers 40 mpg on the highway. By shutting off the engine at stops, recapturing braking energy, and smoothing torque during acceleration, this concept balances turbocharged performance with fuel economy. The Chevrolet TRU 140S concept is a three-door hatchback with the same Ecotech engine and 40 mpg performance on the highway. Honda is showcasing the 2013 Accord Coupe Concept with “next-generation Earth Dreams powertrain technologies.” These three new powertrains include the first U.S. application of both a 2.4-liter direct-injected engine and two-motor plug-in hybrid system. The Lexus LF-LC Concept hybrid 2+2 sport coupe, created by the company’s Calty design studio in California, is a front-engine, rear-wheel drive car equipped with an advanced Lexus hybrid drive. The Nissan Pathfinder Concept gives visitors to the show an early peek at the 2013 Pathfinder SUV, on sale in the United States in fall 2012. This fourth-generation Pathfinder is expected to deliver a 25-percent increase in fuel economy over last year’s model. 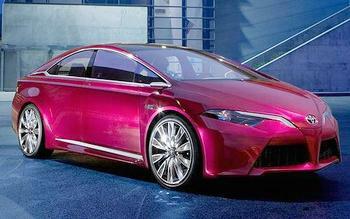 Toyota is offering the NS4 advance hybrid concept – separate from Toyota’s popular Prius family of hybrids. The NS4’s advanced powertrain is a next-generation Hybrid Synergy Drive plug-in system featuring reductions in component size and weight with improved overall fuel economy, better acceleration and a longer electric range, while maintaining a short charge time, the company says. Finally, the Volvo “Concept You” hybrid vehicle combines a sleek coupe-like exterior with a handcrafted four-passenger cabin. Powering the Concept You is a four-cylinder engine that drives the front wheels combined with a Flywheel Kinetic Energy Recovery System linked to the rear axle. Volvo married this innovative powertrain to a new eight-speed automatic transmission. A year-and-a-half after being sold by Ford to a Chinese holding company, Volvo’s “Swedish heart is beating stronger than it has in a long time,” said Maloney.